We look to examine the effectiveness of traditional teaching methods in the undergraduate physics instrumentation laboratory by designing an alternate, active-learning-oriented curriculum accompanied by a portable electronics learning platform, and performing a quantitative comparison of the two teaching methods. Our prototype board is in! Based on a preliminary handmade version, we sent our schematics off for circuit board printing and attached the components ourselves in-house. We’ve been testing it out with our software interface to make sure that everything is working how we expect. So far, only a couple changes needed to be made: one or two of the circuits were not playing nicely with others. This is why we order prototypes! Once we’re completely satisfied that our prototype board is working how we want it to work, we’ll send the plans off for a full manufacturing run. These will hopefully be the boards that some of the students taking our lab course will use next semester! We expect manufacturing to take a few weeks, so in the meantime we’ll be working on refining the software interface to ensure that it’s stable and easy to use. Making software both stable and user-friendly always takes longer than you think it will. Someone will always find a feature that isn’t working quite as well as you thought it was! Because the lab course in which we will be deploying our revised curriculum and specially-designed learning platform is taught in the winter semester, we have the fall months to prepare. This preparation revolves around three primary points: the design and construction of the physical device, the testing and debugging of the device’s software, and the development of the new curriculum. This past month, we’ve selected the parts we’ll use to build the physical device. 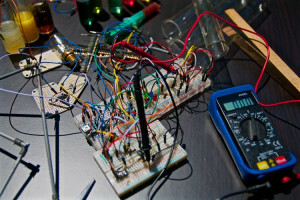 This includes not only the circuit elements that will eventually be printed onto the board, but also the brain of the device: a commercially-available microcontroller. Having finalized our choices for all our components allows us to begin designing the layout of the circuit board for the device, decisions which will have a large impact on the final appearance and functionality of the device as used by students next semester. One of the most important aspects of the device is its durability, something which requires thorough and repeated testing to achieve in software. The platform involves two main branches of code: one which resides aboard the microcontroller chip and is in charge of its functions, and the other which is hosted by the user’s computer, and handles the graphical user interface. Smooth communications between these two programs is key to the platform’s robustness, particularly when used in the unpredictable, real-world environment of the undergraduate laboratory. The laboratory curriculum for the course in question involves five main activities. Of these, three have so far been adapted into the active-learning-focused format. Two more to go!